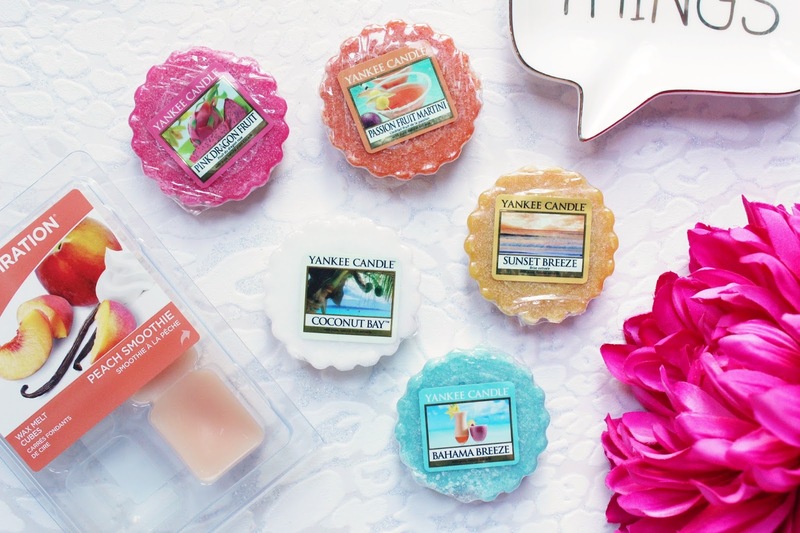 I have fallen back in love with my Yankee Candle wax melts and these are my favourite fruity family scents of the moment. 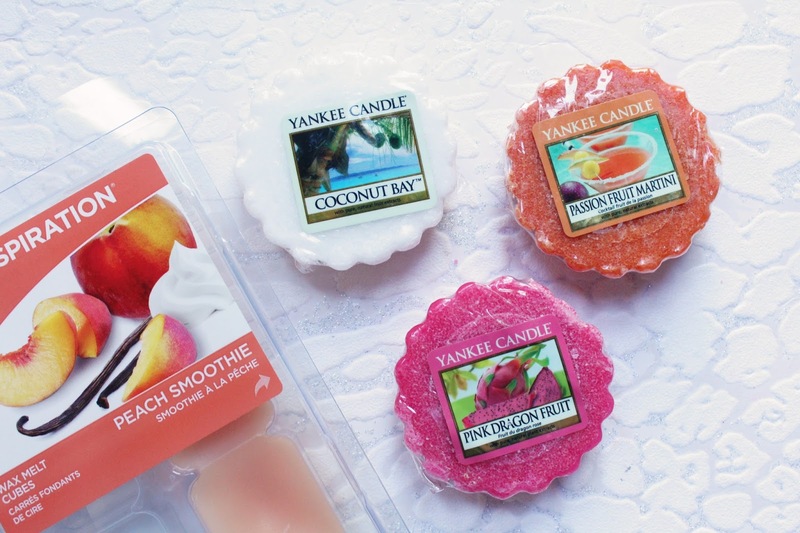 I have always preferred to use the wax melts from Yankee Candle rather than the jar candles as I have found the scent throw to be much stronger. When it comes to jar candles, you can't beat the Bath and Body Works candles! One of my all time favourites from Yankee Candle is Pink Dragon Fruit, I have lost count how many of these I have gone through! This has top notes of Palm Leaves, Tangerine, Hibiscus and Dragon Fruit with mid notes of Papaya, Freesia, Wild Strawberry and Kiwi finished with the base notes of Teakwood and Vanilla. This is a tropical kind of scent but is on the sweeter side when compared to something like Bahama Breeze. Another one I have gone through a fair few of is from the Home Inspiration line, Peach Smoothie, which is available from ASDA Tesco. This smells of ripe, juicy peaches and if you love the Too Faced Sweet Peach Collection, you will be obsessed with this scent! It doesn't smell at all artificial in the slightest. One of my newer melt purchases is Coconut Bay which I picked up from eBay which I think must be an older scent as I haven't seen it on either of the Yankee Candle websites. This is described as being an intoxicating scent of wind-swept palms and coconut milk and it is exactly that! It reminds me of warm summer days and I can definitely see myself using this on a rainy day to brighten up my mood! Another new purchase was Sunset Breeze which is one of the newer scents from Yankee Candle in the UK. I picked this up thinking it might be similar to Bahama Breeze which it is but it is not even close but I have really loved it! This has top notes of tropical pineapple, peach and mango with a mid note of pear blossom finished with the base note of must. 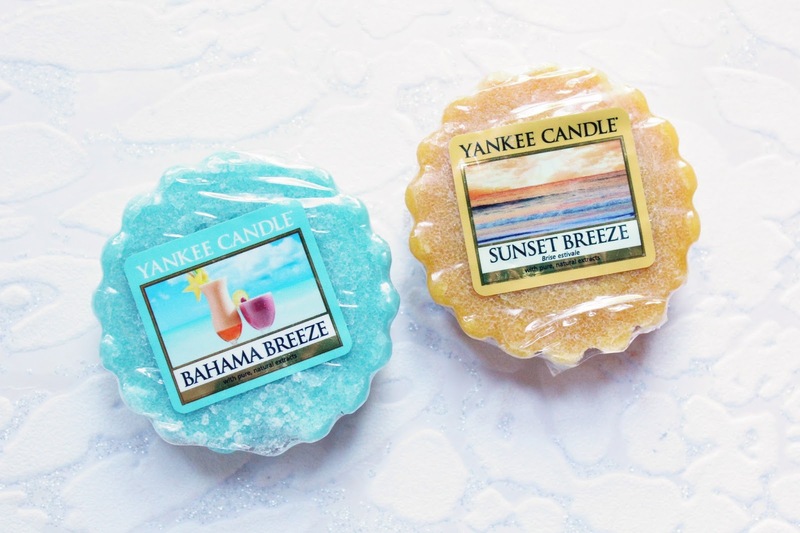 This is a beachy tropical scent. Then the true star of the show, Bahama Breeze. This scent is actually the reason I got into Yankee Candles and I am still sad that this isn't readily available in the UK, thank goodness for eBay and Facebook selling pages for keeping me stocked up! I have never been a person to hoard back-ups but with this scent, if I find them for a good price I buy them all, I currently have four waiting to be used! This is my all time favourite scent, I would wear it if I could! This has top notes of exotic fruits, pineapple and grapefruit, mid notes of mango, peach and tropical fruits with the base note of musk. This is a super fruity tropical scent but is cool and refreshing. All of these scents can fill a room easily once popped into warmer, I like to use an electric one. Bahama Breeze does have the strongest scent throw out of my favourites. If wax melts aren't for you, most of these scents are available in jars too.